Forget those pre-packed kits full of useless items. Definitely forgo those oddball kits marketed to travelers who don't know better. In the rare event you're bitten by a snake, the priority shouldn't be digging around for a snakebite kit! Your kit should contain some quality mainstay items, but it should also be catered specifically to your needs on the road. Climate, destination, and your personal health needs should be considered. Unless you intend to go trekking alone in the Himalayas where getting supplies may not be easy, your travel first aid kit should be lightweight and practical. Bring just a few important items, and buy the rest as needed. Overpacking is the most common mistake made by travelers, and most survival "what-if" items never get used. Don't allow your first aid kit to grow out of control! You'll probably be walking more than you do at home. Blisters are common. Experimenting with new food may cause stomach problems. Hot, humid conditions may cause small scrapes and insect bites to become infected. You'll most likely be very jet lagged the first week after flying to Asia. You may be able to help your travelmate or another traveler met on the road. A digital thermometer can be used to monitor fevers and to determine if you should seek serious medical help. This is particularly useful in places where dengue fever is a problem. Know how to change it between Celsius and Fahrenheit. Bandages (Band-Aids or "plasters") of varying size come in handy, particularly to cover "hot spots" before they develop into full-blown blisters. Take just a few assorted sizes; add a few of the small, round ones for covering insect bites. Medical tape will help keep those bandages in place while you sweat. It has a myriad of other uses that would make MacGyver proud, too. Acetaminophen (Tylenol/paracetemol) is the best pain reliever for fighting mild fevers, but it isn't as good at controlling inflammation after injury. Acetaminophen is generally not considered an NSAID — making it a better choice for people with certain conditions. Ibuprofen (Advil/Motrin) is a useful anti-inflammatory drug to control swelling in case you twist an ankle. It also helps with general aches and pains (e.g., back pain, toothache, etc) that may pop up. People who think they may have dengue fever should avoid NSAIDs such as aspirin, ibuprofen, and naproxen. Anti-diarrhea tablets (loperamide/Imodium) are an unfortunate necessity in Asia. Just a general change in diet and bacterial contamination can lead to traveler's diarrhea. Avoid taking loperamide until absolutely necessary; diarrhea is the body's natural way of flushing bacteria. Keep a tablet close (your money belt or wallet) in case you have problems on transportation when your travel first aid kit is inaccessible. Antibacterial ointment or cream is good for treating small infections before they become bigger problems. Sharp tweezers can be used to remove splinters, ticks, and other annoyances that don't belong under your skin. Don't bring them on the plane! Hand sanitizer should be used before working on an injury, and it comes in handy after using squat toilets where soap is rarely available. Look for the wipes in packets rather than a bottle. Gauze pads are sterile and can be used to clean and cover scrapes or injuries too large for a plaster. Bring a few of different sizes. Antihistamine tablets (Benadryl) are useful for keeping allergies and rashes from exotic foods and plants temporarily in check. Motion sickness pills (Dramamine) will come in handy on rough bus and boat rides. Keep one handy in your money belt in case your bag is stowed and inaccessible. Even if you aren't susceptible to motion sickness, the person next to you might be! The drowsy kind can also double as a sleep aid for long-haul transportation. Electrolyte mixes are good to have on hand in tropical climates. Don't use them on a whim! The high sodium content may do more harm than good unless you truly have lost a lot of sweat. Latex gloves are essential if you'll possibly be administering first aid to someone else or come into contact with bodily fluids. Soft, zippered cases are best for packing; a waterproof case is ideal in case something leaks. Avoid packing heavy glass bottles or liquids that may leak; look for single-use wipes or their travel-sized counterparts. Treat your first aid liquids just as you would toiletries: assume they'll leak or pop during pressure and temperature changes on a flight. As mentioned, bring just enough of each item to get you back to "civilization" where you can easily buy more, if needed. 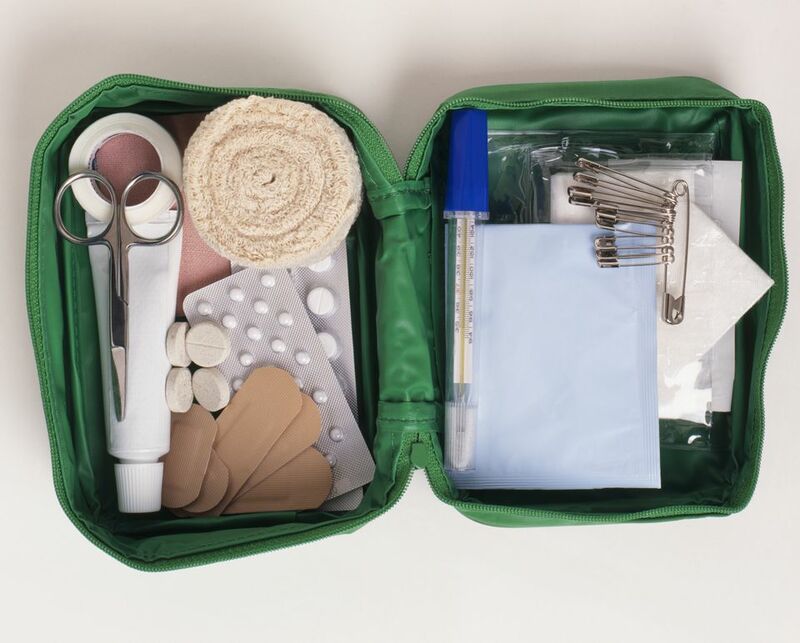 Tip: Custom-picked travel first aid kits make unique, thoughtful gifts for travelers. Build two while at it and give one away! Putting a few of each of the recommended non-prescription pills into a waterproof bottle is a good idea. But months later, you may have trouble identifying what is what! You'll have a hodgepodge of pills that are different shapes and colors. Make yourself a tiny cheat sheet that identifies pills by markings or color. Store it in your first aid kit, or even better, in the pill bottle itself. Although getting held up in customs for bringing prescription medicine from home is very rare, carry your medicine in the original bottle and keep a copy of the prescription handy in case you are questioned — particularly if bringing along a large amount of pills for a long trip. Keep several days' worth of your medication with you on the flight in case your luggage is delayed. Don't try to bring your travel first aid kit on the plane — the gels and pointy objects may raise eyebrows. In many countries, pharmacists act as nurses, diagnose ailments — sometimes even serious ones — and then sell what you need to recover. You won't need to see a doctor or get a prescription; simply walk into a pharmacy and buy what you need. Obviously, self-diagnosing can be risky — head to an emergency room if there's any doubt. Medications ranging from aspirin to Valium can often be purchased at pharmacies throughout Southeast Asia without a prescription. But just as travelers abuse the ability to purchase drugs that would require a prescription at home, some of the pharmacies have become opportunists. They may recommend medicines that you don't really need — particularly antibiotics — just to make a sale. Use discretion. Pharmacists in Asia may or may not know the American brand names that have become synonymous with drugs and first aid items. European brands tend to be more common because they're far cheaper than their American counterparts. Try asking for a "plaster" rather than a Band-Aid or "paracetamol" instead of Tylenol. You'll find pharmacies throughout Asia that carry gauze, ice packs, and all the other bulky items you may want to leave out of a lightweight travel first aid kit. Pack what you need to stabilize the situation, then plan to purchase additional first aid supplies from a pharmacy. Tip: Countries around the world often designate pharmacies with a sign that says "apotek" or some variation of the Greek apothēkē, one root of the word "apothecary." Along with getting the recommended vaccinations for Asia, you'll want to get travel insurance coverage for your trip. A suitable plan should be purchased at home before you leave; the peace of mind that basic travel emergencies are covered is worth the additional trip cost! Read the policy carefully: you may have to pay more for "adventure" sports coverage, and motorbike rentals are rarely covered in travel insurance policies.